Memphis Grills revolutionized outdoor cooking with their 3- in-1 Cooking Centers that grill, smoke, and bake. Founded in 2009, Memphis Wood Fire Grills, manufactures all grills in the USA in their state-of-the-art 135,000 square foot facility. Big, bold, and made in the USA, this Memphis Grills Elite 39-inch Pellet Grill on Cart (Vg0002s) is the ultimate addition to any outdoor kitchen. With a whopping 1252 sq. inches of cooking surface, a large 24 lb. pellet hopper, dual metal convection fans, and precise temperature control capable of anything from 180° to 700°, the Memphis Elite is truly a revolutionary cooking appliance. Temp Range: 180-700 degrees Fahrenheit. Intelligent Temperature Control with Wi-Fi. Double Walled, Sealed, 304 Stainless Steel. Indirect and Direct Flame Modes. Dual Convection Fans. Oven-Grade Gasket. Shelves open for enhanced storage. 24 lb. dual pellet hopper (mix and match pellet flavors). The VG0002S are now WiFi Enabled (May 2016). 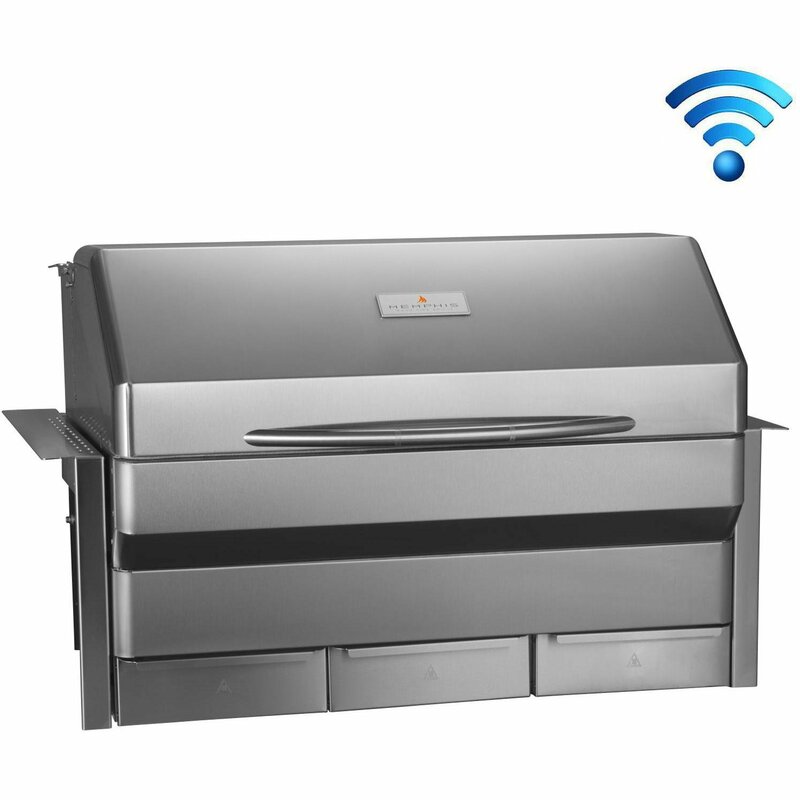 The Memphis Grills Elite Wi-Fi Controlled 39-Inch Built-In Pellet Grill (VGB0002S) features heavy-duty 304 stainless steel construction, 6mm nickel-plated steel cooking rods, and a combination of dual wall and sealed construction. 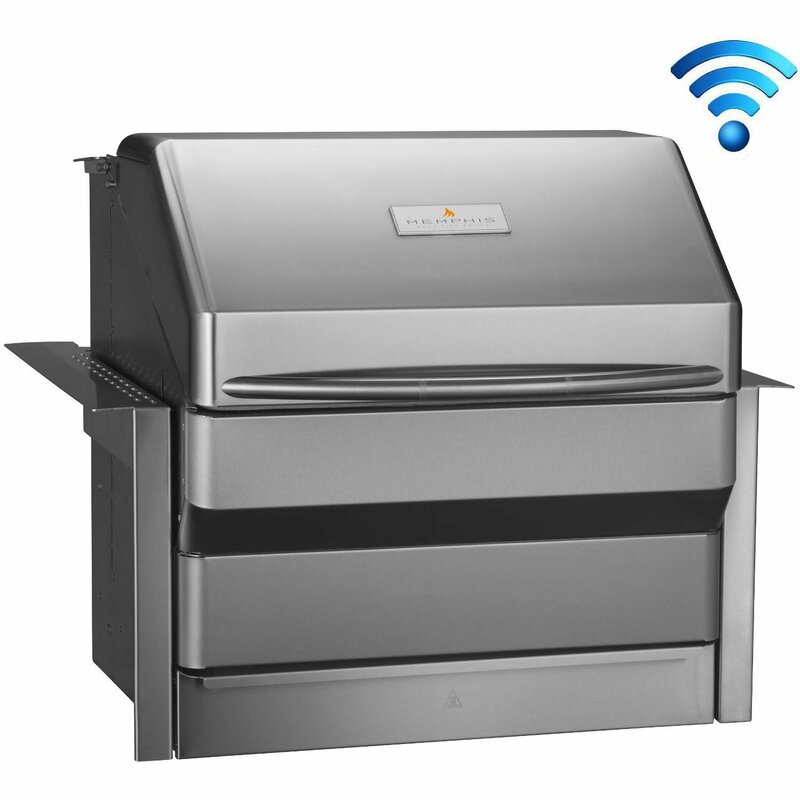 With an integrated Wi-Fi controller and free Memphis Mobile iOS App, you have the freedom to control your grill from anywhere you desire. 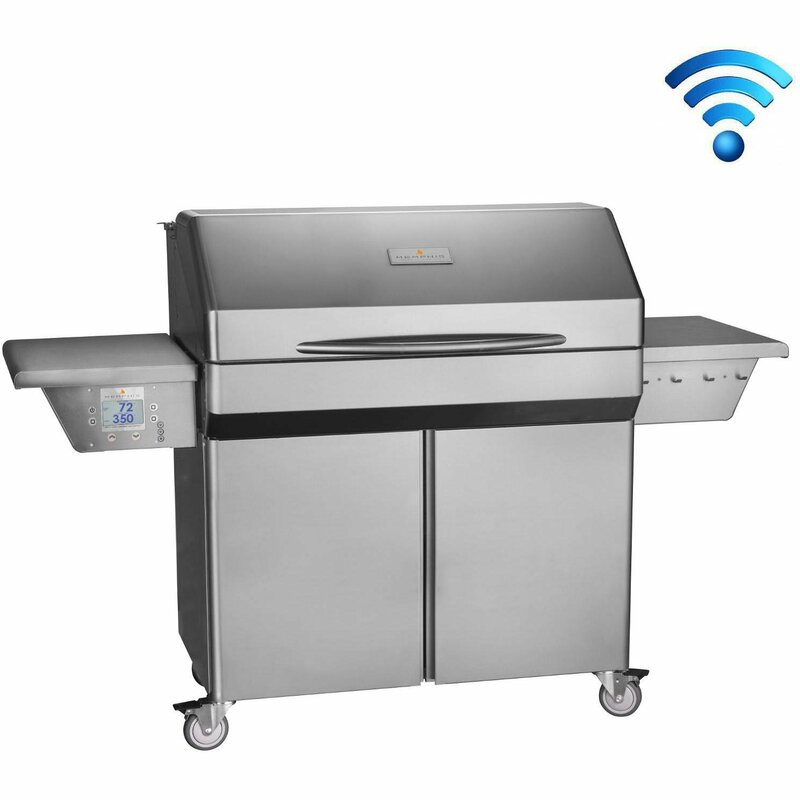 The grill can also be controlled using the Intelligent Temperature Control which can be mounted near the grill in your outdoor kitchen. The natural wood pellets feed into the burn pot where they are automatically ignited. The dual fan convection system fuels the fire with oxygen to create a convection oven by evenly distributing the air over the 844 square inches of main cooking area. This air circulation allows the grill to cook food faster and eliminates hot spots in the grill. With a temperature range of 180 to 700 degrees Fahrenheit, you can sear steaks using the included Direct Flame Insert, or remove it when cooking at lower temperatures. A convenient Genie Multi-Tool is also included so you can remove the direct flame insert easily, or use it to clean the grill. The Memphis Grills Pro 28-Inch Grill on Cart (VG00021) features Double-walled construction and made with the highest quality stainless steel, the Memphis Pro Wood Fire pellet grill combines the very best parts of a kitchen oven, a real wood fire, a BBQ gas grill, and a smoker. Temp Range: 180-650 degrees Fahrenheit. Intelligent Temperature Control with Wi-Fi. Double Walled, 304 Sealed Stainless Steel, Indirect and Direct Flame Modes. Dual Convection Fans. Oven-Grade Gasket. Shelves open for enhanced storage. 18 lb. dual pellet hopper (mix and match pellet flavors). The VG0001S are now WiFi Enabled (May 2016). The Memphis Grills Pro 28-Inch Grill on Cart (VG000214) features Double-walled construction and made with the highest quality stainless steel, the Memphis Pro Wood Fire pellet grill combines the very best parts of a kitchen oven, a real wood fire, a BBQ gas grill, and a smoker. Temp Range: 180-650 degrees Fahrenheit. Intelligent Temperature Control with Wi-Fi. Double Walled, 430 Sealed Stainless Steel, Indirect and Direct Flame Modes. Dual Convection Fans. Oven-Grade Gasket. Shelves open for enhanced storage. 18 lb. dual pellet hopper (mix and match pellet flavors). The VG0001S4 are now WiFi Enabled (May 2016). 562 sq. in. cooking area – 834 sq. in. with optional grates. 4,320 cubic inch total. Intelligent Temperature Control with Auto-Start included. Dual fan convection system with metal blades provides even heat circulation for convection cooking. 18 lb. pellet hopper with two 9 lb. bins lets you automatically mix a variety of flavors. The Memphis Grills Pro 28-inch Built In Pellet Grill (Vgb0001s) 8mm diameter stainless steel cooking rods, and a combination of dual wall and sealed construction. 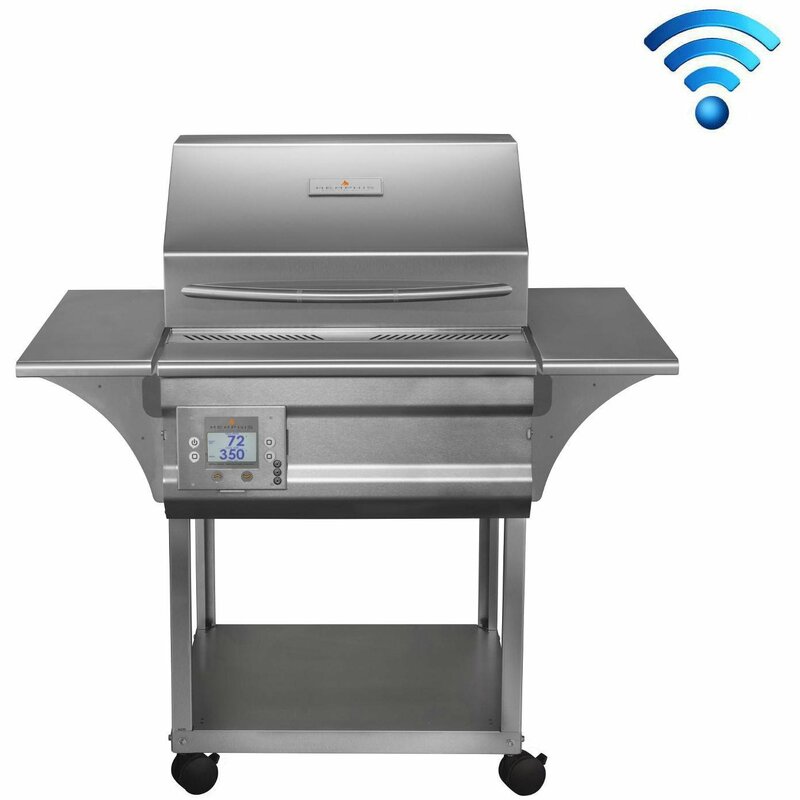 With an integrated Wi-Fi controller and free Memphis Mobile iOS App, you have the freedom to control your grill from anywhere you desire.The grill can also be controlled using the Intelligent Temperature Control which can be mounted near the grill in your outdoor kitchen. 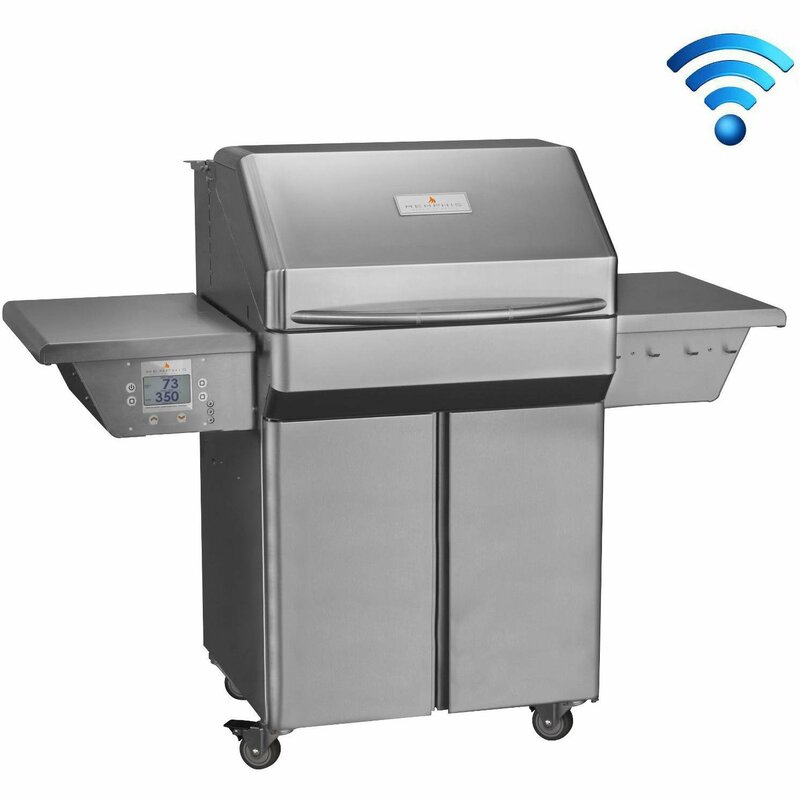 The Memphis Grills Advantage 26-inch Pellet Grill on Cart (Vg0050s4) is a world-class 3-in-1 outdoor cooking center that features a circulating metal convection fan, a 200° to 600° temperature range, and a 12 lb. pellet hopper. By utilizing 100% natural and renewable wood pellets instead of the traditional propane or charcoal, Memphis Wood Fire barbecue grills offer unparalleled flavor and cooking power with the touch of a button. Temp Range: 200-600 degrees Fahrenheit. Intelligent Temperature Control with Wi-Fi. Double Wall, 430 Stainless Steel Construction. Indirect and Direct Flame Modes. Single Convection Fan. 12 lb. pellet hopper. Memphis Grills revolutionized the environmentally-friendly grill game. The reason Memphis Grills is the leader of environmentally-friendly grills is their use of 100% natural and renewable wood pellets instead of traditional propane or gas. The Memphis Grills natural wood pellets have no chemicals or additives, making them safe for the atmosphere and able to burn cleanly and evenly. One of the many exciting reasons to invest in Memphis Grills is the ability to maintain a desired temperature, much like an indoor oven. When grilling on Memphis Grills, the temperature stays consistent because of the use of an Intelligent Temperature Control system that automatically keeps the temperature exactly where it’s supposed to be. Want to control and monitor Memphis Grills on your phone from anywhere? There’s a Memphis Grills app for that! The automated ITC system is able to access a list of recipes to perfectly cook anything you are grilling- you don’t even need to be at home with your Memphis Grills! 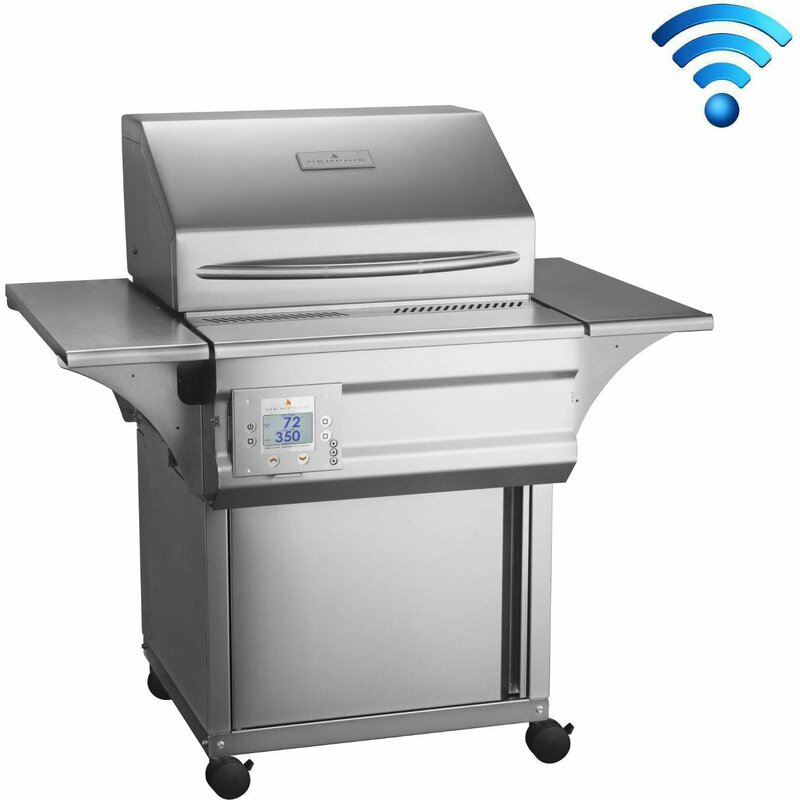 Whether you are looking to bake, sear, smoke, or just need to convection cook, Memphis Grills is the best option for optimum versatility, flavor enhancement, and state-of-the-art technology.